Sarbet, whose name literally means ‘grass house’ is a charming neighborhood just outside the main city area. Although it used to be considered mainly a residential area, it has quickly become a popular expat hang out due to its close location to the African Union, the large International Evangelical Church, and the Canadian Embassy. Sarbet is considered a desirable place to live by many expats because of the secluded street of homes located behind the Canadian Embassy. It’s one of the few places within the city that has a decent amounts of trees and flowers. Houses in the area can be a bit expensive with most costing between 30,000 and 40,000 Birr a month. However, the homes usually have several bedrooms and bathrooms and are surrounded by a garden area and secure fencing. If you’re a single person and aren’t looking for a fancy place to live, you can find a simple one bed room apartment for around 3000 Birr a month. For those staying only a short time, there is one hotel in the area called King’s Hotel. It’s located across from the International Evangelical Church (IEC) and is know for its great service and free wifi. Most rooms cost between $50-65 a night. Sarbet isn’t known for being a great shopping destination, however, there are a few stores in the area. Most of them are found inside Adams Pavilion which is the large building beside the roundabout. One of the most popular stores you can find there is the international best selling brand, sole Rebels. Adam’s Pavilion also has several ATMS in the lobby. 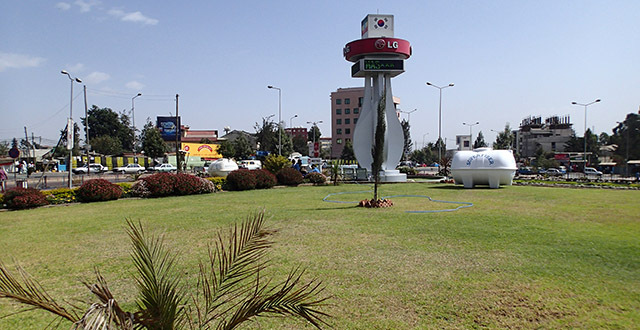 Piñata, considered the best part supply store in Addis, is located in Sarbet too near King’s Hotel. It has everything you need for your next celebration including custom made piñatas. There are also two grocery stores in the area that are both known for carrying a decent amount of Western food brands. The first is Novis Supermarket which is located next to King’s Hotel. The second is Fantu Supermarket which is after the roundabout on the way to Karl’s square. Many people also enjoy shopping at the NGO bizarre which is held at IEC the last Saturday of every morning from 9am-11:30am. The vendors sell all types of food, crafts, and artisan designs. Getting to and around Sarbet is easy. Mini-buses from Mekanissa, Mexico, and Gabrielle all pass through the area, and any contract taxi would be familiar with getting there as well. You can also find a bus out of Sarbet by waiting at any of the main bus station areas which are located on both sides before and after the overpass. You can also usually find a ride by waiting outside the Canadian Embassy or Munich German Bakery and Cafe. Contract taxis are also prevalent and will stop just about anywhere in the area. The only thing you must keep in mind though is that because there are no clubs or bars in Sarbet, transportation shuts down early. After 9pm, it will become difficult to find a ride home. Sarbet offers lots of choices for cafes and restaurants. Most of them only serve Western food though so you will probably be out of luck if you’re craving injera. Kaldi’s – This popular chain cafe is always a popular meeting place and is located in Adam’s Pavillion. It’s quite loud here so if you need some peace and quiet, it’s better you look elsewhere. Tomoca – This is both a cafe and an art gallery. On warm days they also open up their roof top for those wanting some sunshine. Bella’s – Many choose this place for its selection of cakes. They also serve coffee, tea, and other quick bites. Efoye – Located next to King’s hotel, this restaurant has some of the best pizza and sandwiches in town. They also offer a soup of the day and several vegetarian meal options. The place is quite small and their sign is written only in Amharic so it’s quite easy to miss, however, it’s worth hunting down because the food is amazing. Garden Paradise Restaurant and Bar – Located in Adam’s Pavillion, this restaurant has several different Western food dishes as well as big screen tv’s which they turn on for football matches. Munich German Bakery & Cafe – This cafe offers both lunch and dinner options, although it is mostly known for fresh baked bread and touch of German influence. It’s located across the street from the Canadian Embassy.